This beautiful tricolor satin cockade is hand-sewn onto period-correct buckram. Real pine cones adorn the center. (See description below) Felt backing and sterling silver plated pin on back. Approximately 3" (7 cm) across rosette. Pin back is 1" (2.5 cm) wide. Individual pine cones may vary. "Patriotic individuals were sporting secession badges on their lapels and bonnets. Described as folded blue ribbons, some badges were red, white, and blue ribbons. Others wore a flower posy called a Southern badge, which consisted of a cluster of hyacinths and arborvitae tied with red/white/blue ribbons. Other men preferred a rosette of pinecones. 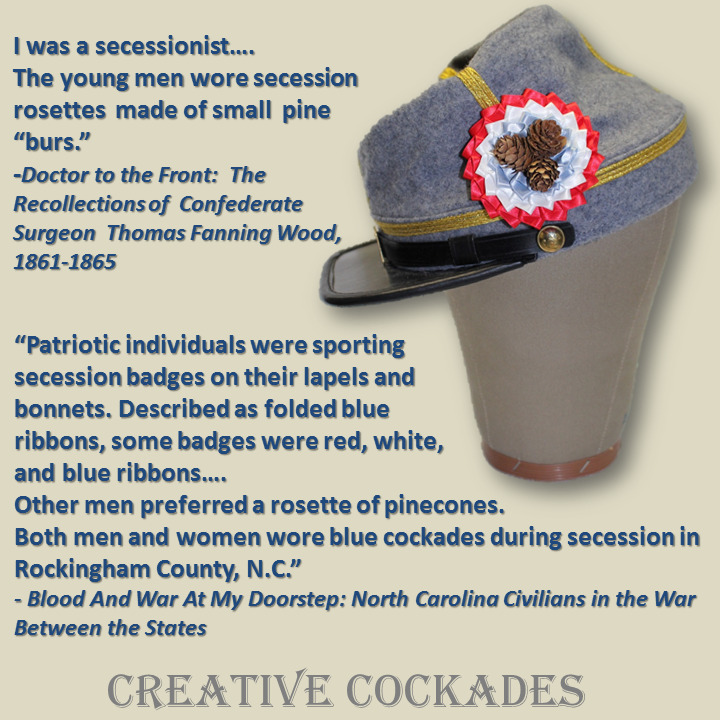 Both men and women wore blue cockades during secession in Rockingham County, N.C."